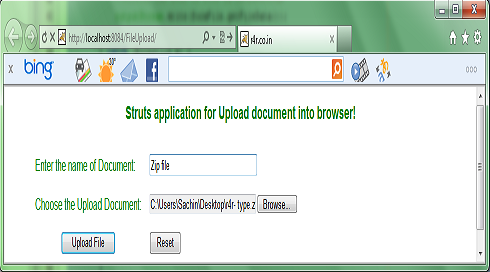 In this chapter, you create a new Struts application for the purpose of upload any kind of document( like image, PDF, Txt , doc, and etc. ). This is very good example to show the great flexibility and dynamic property of dynaActionForm. For each piece of the application, we show you the code and then explain the code. 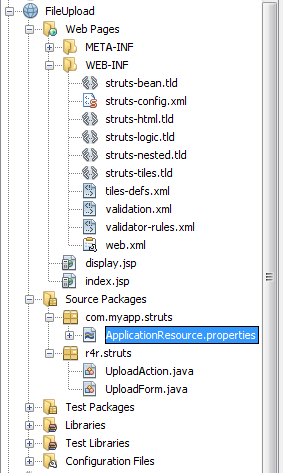 This application design in NetBeans IDE- 6.8 with Struts 1.3. One DynaActionForm class name as a UploadForm, used for store data as application need. One Action class name as UploadAction.java, used for provide specific processing functionality. Note:-When you click Finish button, your NetBeans IDE configure everything in place and project open in your IDE. 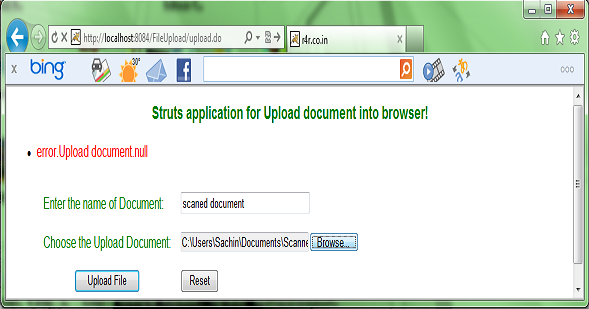 Step- 4: Open Display.jsp page, from your struts application and code it as describe below. Name of File: <b> <bean:write name="UploadForm"
Name of Upload File: <b> <bean:write name="UploadForm"
Step- 7: Now introduce Bean class into struts-config.xml file, Since In this application we used DynaActionClass so no need to make another Bean/Form class. 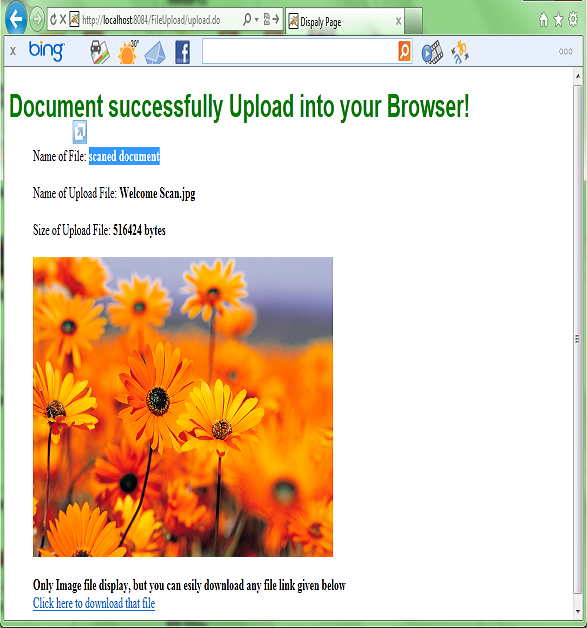 Task-1: Upload Image into browser. Check validation in to JSP page. 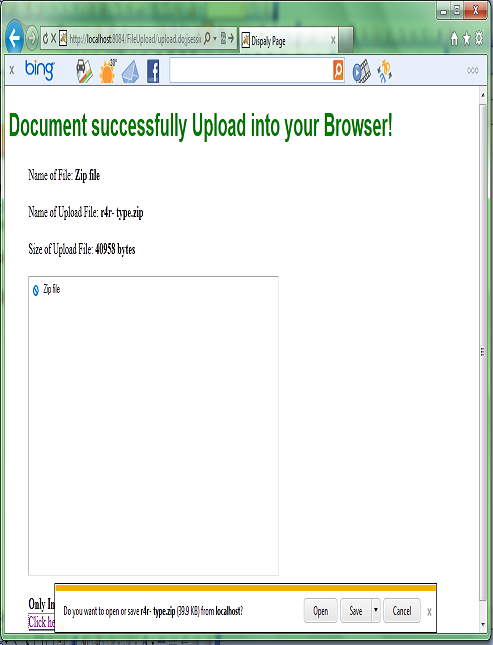 File successfully upload into browser( also display the size of document). 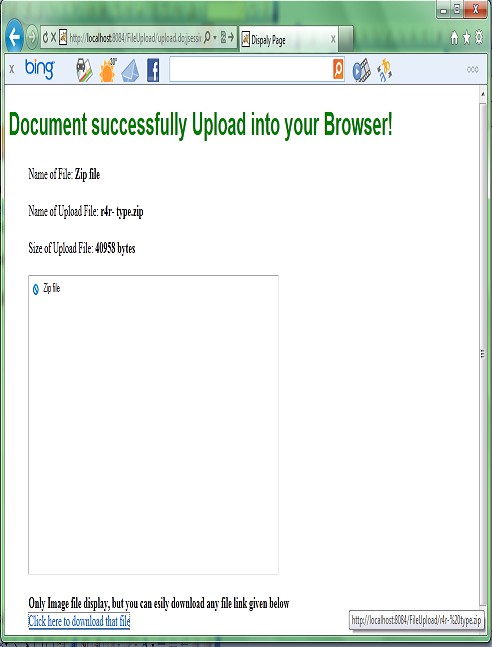 Task-2 Upload a Zip document into browser.